For related context regarding “Pallywood”, “Hezbollywood,” the libelous Islamic flaming of religious conflict and the Regime’s disgraceful Jewish self-hating responses, click here. 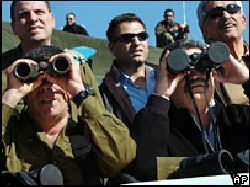 Defense Minister Amir Peretz, for whom it would make no difference whether or not his binoculars are capped when he looks through them, is incapable of leading national defense in a time of war, so he looks for easy prey to bully; the Jews of Yehuda and the Shomron. And The Turks Didn’t Know Their Airspace Used for Iran Contraband? 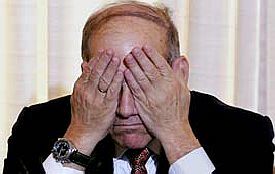 Olmert, Give Us a Break!! Gimmel’s Chance for a Partial Atonement Regarding Gush Katif? MK Moshe Gafni of United Torah Judaism said Thursday that he would consider bringing a vote of no confidence in the government due to the government’s treatment of the Jews who were expelled from Gush Katif. Gafni’s decision came during a visit to Nitzan with MK Uri Ariel (NU-NRP). The government has acted cruelly, he said, to the people which it expelled from their homes. For related reports, click here.